Wednesday: "Spaghetti. that's all; just spaghetti. oh, and garlic bread"
Thursday I'm taking my cousin out for her birthday then hopping on a red eye back to Ohio to spend the weekend with some of my favorites! A hockey game, bridal shower & bachelorette party for my BFF, a baby shower for a good friend and lots of family time. I cannot even begin to express how excited I am, this week cannot go by fast enough. I have been craving some family time and time with my best friends like crazy lately. Be prepared for me to blow up your IG feed this weekend! Follow me, @bleudressjes, to see all the festivities. Your week sounds so yummy! 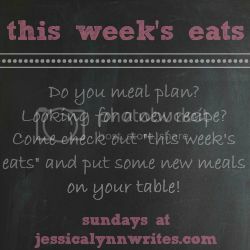 We do menu plan but we need to get more organized with it!